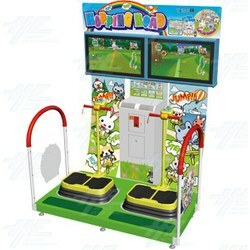 The Hopping Road arcade machine is a novelty video game from Taito. The cabinet has a platform to stand on, and a stick and handlebars for the player to hold onto. It is meant to replicate a pogo stick, with players bouncing on the platform to control their character as they race through a course on a pogo stick. There are a variety of different pickups to collect during the race to give you an edge over your competitors. These include 'Happy Jewelry' which increases your hopping speed, and a Super Jump pickup which allows your character to jump a great distance. There are 4 different courses to race on, and players choose from on of 8 characters to play as. Hopping Road is the first in a series of 'No-brainer fun' games Taito is developing. It is simple to understand and easy to play, and will appeal to people of all ages. Cabinets can be linked for versus play, with up to 4 players able to race together at the same time. There are a variety of different pickups to collect during the race to give you an edge over your competitors. These include 'Happy Jewelry' which increases your hopping speed, and a Super Jump pickup which allows your character to jump a great distance. There are 4 different courses to race on, and players choose from on of 8 characters to play as. Hopping Road is the first in a series of 'No-brainer fun' games Taito is developing. It is simple to understand and easy to play, and will appeal to people of all ages. Cabinets can be linked for versus play, with up to 4 players able to race together at the same time.